This printer is not available anymore – it was replaced by the HL-2035, which is nearly identical regarding the technical data and can be used under Linux with the same driver. Since I already use this device for quite a while, I want to tell about my experiences with it here. The Brother HL-2030 (and its successor HL-2035) is a B/W-LED-printer to be used at the personal workplace. The use of LEDs instead of a laser has the advantage, that the printer can be build very compact and low priced – therefore LEDs became the standard in this kind of printers. When I bought this printer in 2005 the price was 120 EUR. The successor HL-2035 is offered for less than 100 EUR (as of beginning of 2012). The connection is done via USB. Altough this device is a “GDI” printer, Brother also offers drivers for Linux and MacOS. The major reason for the purchase was the fact, that I only print seldom and then mostly letters or technical documents – and for this I don’t need color printing, but a printer, which works flawless even after longer periods without use. With the previously used ink jet printer the quality was all right – but the ink cartridges regularly became dried up, because I didn’t use the printer very often. In this respect, the HL-2030 fulfilled the expectation – after several years and about 800 pages still the first drum and the first toner cartridge is used – but the printouts are still flawless. Also the dust protected storage of the paper stock of up to 250 pages is a big advantage. The resolution of 600 DPI or 600×1200 DPI in “HQ 1200” mode is completely sufficient for text or line drawings and the print quality is, compared to the price of the device, very good – but it can happen, that the internal memory of 8 MB is not enough, when you want to output graphics filling the page at the highest resolution. But at 600 DPI this is not a problem. For photos this printer is not very suitable – but it is not intended for this anway. The operating noise is not extremely loud – but also not really quiet. The guides for the manual paper feed are bit “flimsy” – the guiding rails move to the side at the lightest touch, so you have to hold them even when just inserting a single sheet of paper to avoid the guides moving sidewards. On the other hand, there is a “real” power switch, so the device will be completely disconnected from the mains and not only be put into a standby mode. The supplied drum is construed for 12000 pages, the toner cartridge for 1500 pages (at 5% covering). Replacement toner cartridges are construed for 2500 pages. The prices for drum and toner are – compared to the purchase price of the printer – quite high. Officially a new drum (DR-2000) costs about 95 EUR, a new toner cartridge (TN-2000) about 76 EUR. On the market these parts are also available a bit cheaper. Compared to the most ink jet printers, this is quite low priced – and you have the advantage, that longer breaks without printing are not a problem. On the other hand, the power consumption of about 450 watts during a printout and even 70 watts in idle mode are obvious higher than ink jet printers – but this is partly balanced by the speed. A larger printout, which takes about an hour with an ink jet printer, which prints 4 pages per minute is done with the HL-2030 in less than half of the time and the printer can be turned off completely afterwards. Although i was a bit sceptical in the beginning, if such a “cheap laser” will work in the long run, the HL-2030 was an excellent choice for my purposes – casual printing of letters and shorter text. The usage under Linux is also possible without any problems. Of course you can not expect miracles in speed or high quality printing of pictures – but the device is not intended for that anyway. Update January 2012: Meanwhile the first new toner cartridge for about 50 EUR is needed, which will last another couple of years at my low printing volume. The printer still works flawless. Update March 2014: Another two years passed – and the printer still works fine after nine(!) years and still uses the first picture drum with which it was originally equipped. 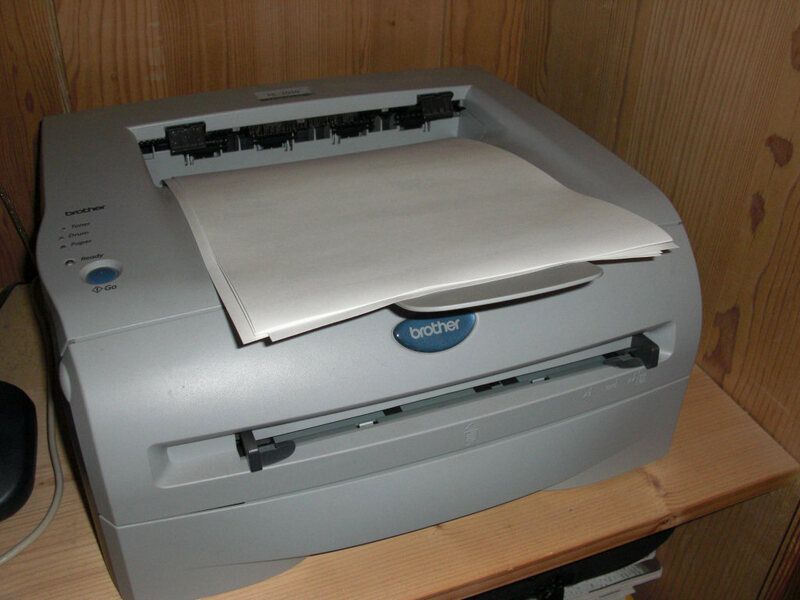 Update March 2016: The printer is still in use – a really durable device :-).